Recumbent bikology in the urban jungle. : What I'm riding in town these days. 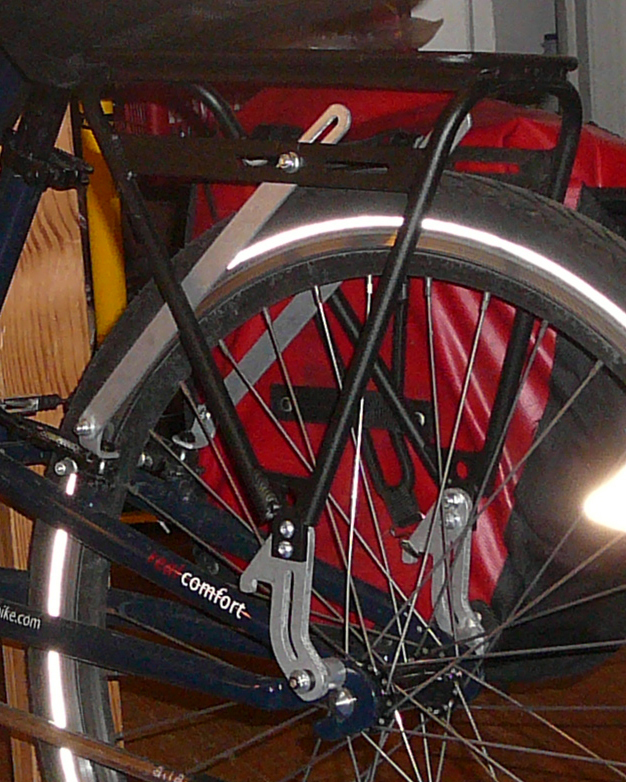 This is a Cruzbike Sofrider loaded with groceries, including kale and swiss chard. For the past few months I've been riding a Cruzbike Sofrider around town as my city "beater." 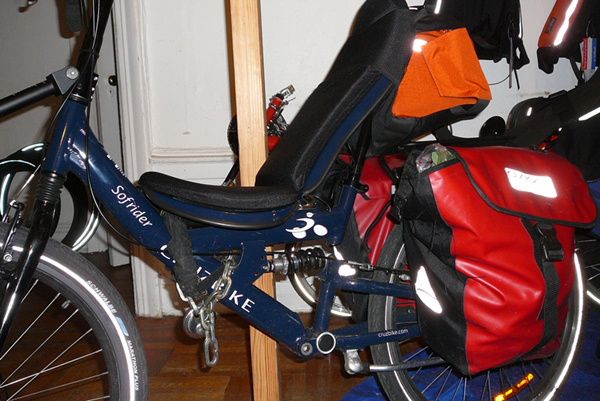 The Sofrider is a capable commuter and touring bike, but it's not immediately obvious how properly to attach luggage. I'm using a Radical Designs Solo Aero on the back of my seat. You can buy it from New York City Recumbent Supply. This is an excellent, well-made, capacious bag of 12 liters volume. That's about half a good-sized daypack. It quickly slides down over the seatback and comes off just as fast. With the carrying strap it's easy to manage. Reflective tape on the back. Comes in five pretty colors. I love it. Another detail that makes the Sofrider good for a city bike is that there is a hole in the frame where you can string a lock. 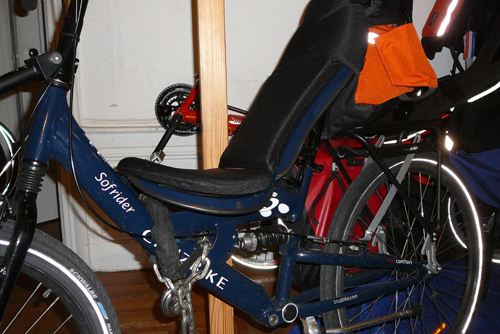 While riding, I loop a chain-style lock two-times through the frame and under the seat. The lock hangs a bit loose and sometimes makes noise, but it hangs out of the way of the wheels and contributes its weight in a useful place -- right under the seat. I haven't gotten around to adding fenders and I've suffered for it. I need to add them soon. The last rain was cold and wet and dirty. On the Sofrider, I want to keep the weight forward of the rear wheel as much as possible so the front wheel doesn't lose traction on the hills. So, I've mounted the rack backwards, with the rear of the rack turned to the front, to bring the carrying rails as far forward as possible. Then, I mounted the vertical supports such that the curve of the vertical adapter moves the rack forward of the rear axle. I have also used the fender mounting holes in front of the axle. This is not so much to move the rack forward as it is to allow me to use my front wheel Pitlocks on the non-drive (rear) wheel. The installation would be stronger if I attached the vertical supports to an extra long quick release through the axle, but I much prefer to keep the wheel locked. So, I guess I'm living on the edge a bit. If I had done this for a customer, as opposed to for myself, I'd have used extra long Pitlock skewers through the axle and mounted the rack's vertical supports on those extra long skewers, because that is really the right way to do it. Notice that the mounting rails on the Sherpa come well forward of the rear axle. 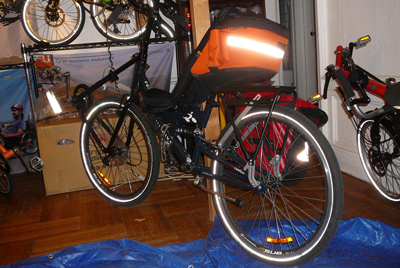 It's easy to load the panniers so the weight is forward of the rear axle. When the rack is installed like this, the front drive wheel maintains a good grip on the street even with heavily loaded panniers.